MENGO– Organizers of Buganda end of year concert ‘Enkuuka’ have revealed that red colour will not be allowed inside the Lubiri on December 31. 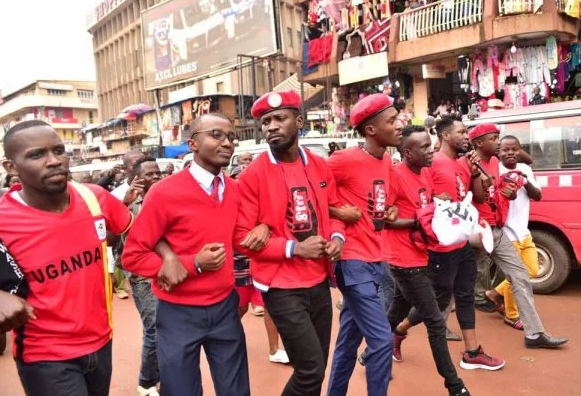 They say the colour has security issues as it identifies the Kyandondo East Member of Parliament Robert Kyagulanyi Ssentamu and his People Power. In a press conference held on Thursday 27 at Bulange- Mengo, Moses Lubuulwa, one of the event organizers from Luba Events confirmed that despite the ongoing conflict between Police and Bobi Wine the singer will entertain the Kabaka and his people but red colour will not be allowed inside. Lubuulwa said the people intending to attend the event will not be allowed to wear anything red in colour since the attire has issues with security. He said the presence of Bobi Wine in the concert doesn’t imply revellers putting on red because it reflects something different. However, another organizer of the Enkuuka, Abbey Musinguzi, alias Abtex promotions expressed his concern saying that revellers should be allowed to wear any colour of their choice. “Have those people stopping you from wearing red bought for you clothes? One should be allowed to come in any colour of their choice. Is politics barred from this country?” People should come in red, yellow, green name any colours,” Musinguzi told journalists at Bulange on Thursday.